Today we have a wonderful episode where Mr. Horsley of our duo is at the Rose City Comic Con running his very own artist alley booth. Come listen to his tales of prodigious capitalism at its finest. 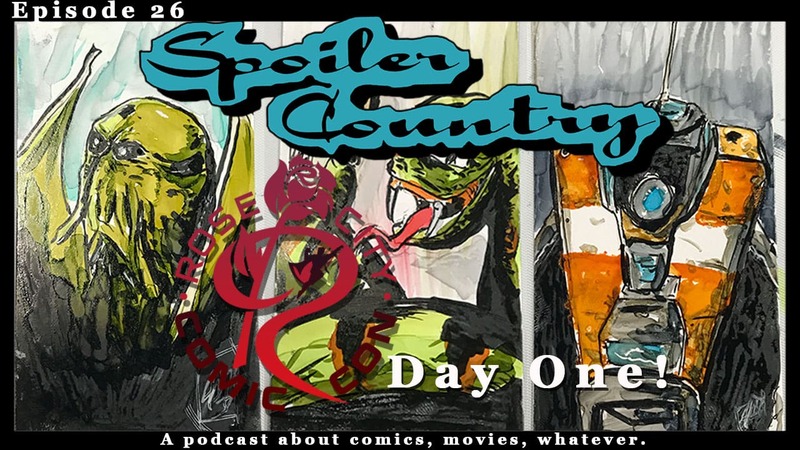 Hear the tantalizing stories of possible futures of episodes near and far for Spoiler Country! Fun rides ahead ALL ABOARD! Don’t forget, we are doing a giveaway for a SIGNED copy of the COPPERHEAD trade paperback SIGNED by SCOTT GODLEWSKI! To enter just head to twitter and follow us then tweet at us with #scCopperhead! Winner announced in one week! Some pictures from the show! Snake from The Eynes Anthology. ← “Birth of the Dragon” – The Best Steve Mckee bio pic ever!